Earlier this month, the Unicode Consortium debuted its final list of new emojis for 2019—and we debated it. Some men felt challenged by what Pinching Hand implied about their bodies while some women challenged Drop of Blood for not being explicit enough about theirs. Many of us squeed at the fresh, furry faces of Sloth and Otter, while others squirmed, concerned that emojis are becoming something of a zoo. The 2019 class of emojis is more inclusive than ever, representing, for instance, people with disabilities as well as providing more gender and racial diversity in relationships. But as their ranks grow, it seems emojis themselves are becoming more divisive than before. So, just in time for Valentine’s Day, we thought we’d look back to 2018 with an Emojiology on a sophomore emoji that brings us all together: 🥰, or Smiling Face With Hearts. 🥰 Smiling Face With Hearts depicts a yellow face with smiling eyes, rosy cheeks, and several hearts floating around its head, as if in a cloud of love. It commonly conveys warm and fuzzy feelings, especially feeling loved or being in love with someone or something. It may also convey various happy, affectionate sentiments more generally, such as feeling content or blessed. 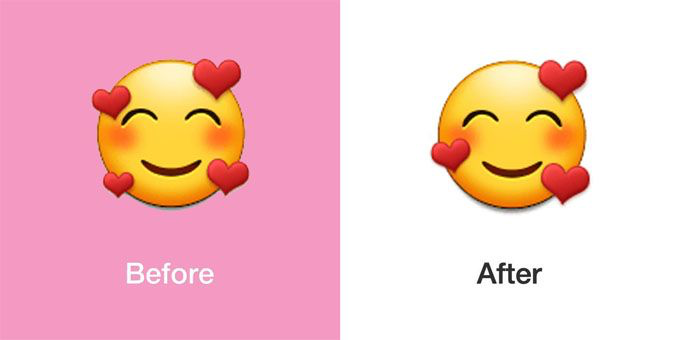 We first swooned for 🥰 Smiling Face With Hearts in 2018, when it was approved as part of Unicode 11.0 under the name Smiling Face With Smiling Eyes and Three Hearts, with Smiling Face With 3 Hearts used as the original short name. Smiling Face With Hearts no longer references the specific number of floating hearts in the latest version of Unicode's emoji documentation, though the original code point name can never be changed. Above: How Smiling Face With 3 Hearts displays across major platforms. Its appearance is fairly uniform, though Samsung includes a fourth heart. Vendors/Emojipedia composite. Despite the name originally stating "three" hearts, Samsung upped the love with four hearts* while Apple features the same smiley as for its ☺️ Smiling Face. Google, WhatsApp, and Facebook do repurpose their 😊 Smiling Face With Smiling Eyes. Above (left to right): Apples's Smiling Face and Smiling Face With 3 Hearts emojis; Google's Smling Face With Smiling Eyes and Smiling Face With 3 Hearts emojis. Apple/Google/Emojipedia composite. Nitty-gritty differences aside, all versions of 🥰 Smiling Face With Hearts share a lovey-dovey look. Its contented countenance, cherubic cheeks, and hovering hearts—typically two to the right, one to the left— suggest someone basking in the warmth and glow of love. Especially the love of our keyboards. 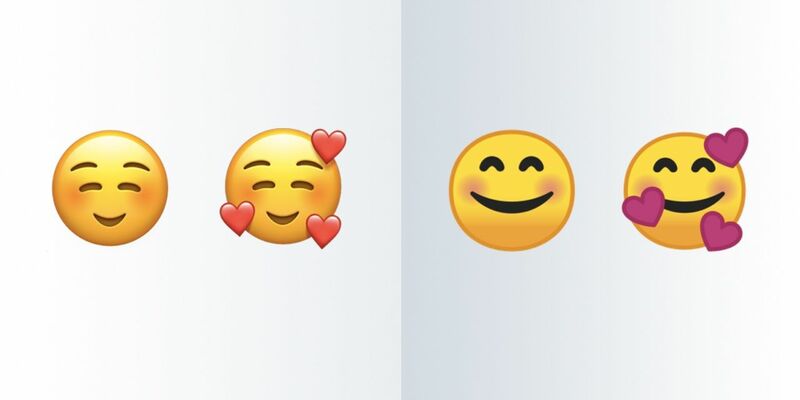 🥰 Smiling Face With Hearts was the most popular new emoji in the 2018 cohort, which included other beloved newbies such as 🥴 Woozy Face and 🥳 Partying Face. When it comes to love, 🥰 Smiling Face With Hearts has serious competition—and not just on Valentine’s Day. ❤️ Red Heart, 😘 Face Blowing a Kiss, and 😍 Smiling Face With Heart-Eyes are consistently three of the most used emojis around the year and across the world. 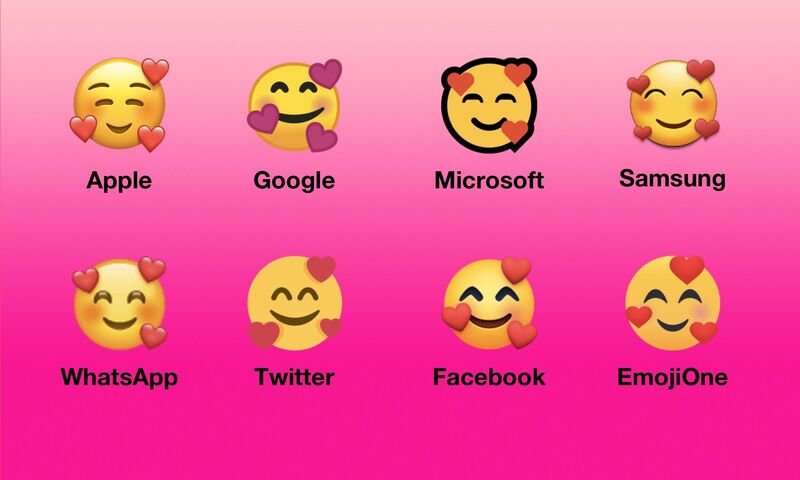 Only time—and people updating their software so they have the latest emojis—will tell if 🥰 Smiling Face With Hearts shacks up with those darlings. As we discussed in an earlier Emojiology, 😍 Smiling Face With Heart-Eyes often expresses feelings of love, infatuation, and adoration. 🥰 Smiling Face With Hearts, as we’ve defined it here, often conveys feeling loved or being in love with someone or something. These senses are very similar, and indeed, many people use 😍 Smiling Face With Heart-Eyes and 🥰 Smiling Face With Hearts to similar ends. Many even pair 😍 Smiling Face With Heart-Eyes and 🥰 Smiling Face With Hearts for style or emphasis. They’re like two peas in pod: A more active 😍 Smiling Face With Heart-Eyes sends the love and a more reactive 🥰 Smiling Face With Hearts receives it. But like 😘 Face Blowing a Kiss, 😍 Smiling Face With Heart-Eyes can come across as a more romantic emoji, which may deter some from sending it to friends and family. ❤️ Red Heart, and its many heart-themed companions like 💕 Two Hearts or 💖 Sparkling Heart, can be less amorous in tone, but also less personal. We’ll see how it comes of age, but 🥰 Smiling Face With Hearts may just fill the gap: It's sentimental but not sexual, loving but not lustful. If you’re scrolling your screens for a way to convey You make me feel good or You’ve made me feel special but don’t want to risk seeming too forward or intimate, then 🥰 Smiling Face With Hearts will do the job. Of course, like many other emoji, we're already seeing a great range in tone and topics for 🥰 Smiling Face With Hearts. It can show affection for people—and pizza, puppies, or K-pop. It can express love, being in love, and loveliness, but also other tender feelings like satisfaction or gratitude. None of this is to say you can’t tap out a 🥰 Smiling Face With Hearts to your sweetheart on occasions like Valentine’s Day. Its love can be platonic and playful, yes, but it can also be passionate. So, too, can 😍 Smiling Face With Heart-Eyes, 😘 Face Blowing a Kiss, and ❤️ Red Heart. That’s the beauty of our favorite emojis: Thanks to their versatility, they know how to spread the love. And perhaps all our debates and divisions on emojis, whether in number, design, or representation, are just lover's quarrels. The popularity of 🥰 Smiling Face With Hearts proves—as we see with the enduring appeal of 😍 Smiling Face With Heart-Eyes, 😘 Face Blowing a Kiss, and ❤️ Red Heart—two things. We love smileys, and we love heart-themed emojis. That should make us feel, well, 🥰. *Update: As of February 20, 2019, Samsung One UI 1.0 now renders 🥰 Smiling Face With Hearts with a cross-platform-consistent three hearts, as shown below.